Lunchmates brings co-workers together for lunch. They meet new colleagues and chat with known colleagues. Learn something new from your co-workers or get to know what they’re up to. Sign up and create a community for free. No credit card info required. Just try it out, no strings attached! Groups who go out for lunch together are matched regularly. An organizer needs to set up a community and invites their colleagues. We take care of the rest. Host regular lunchdatesYou'll decide when's the best timing for the lunch roulette. We will connect you on a regular basis with a single person or group of people from your organization. 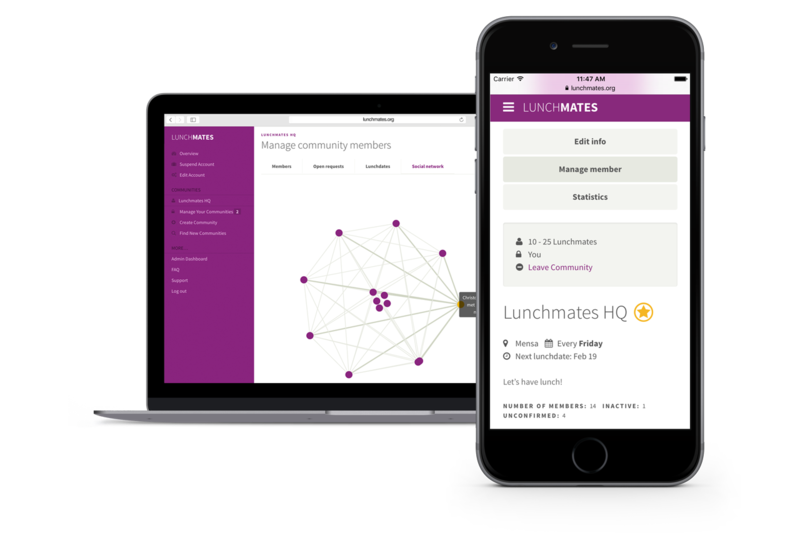 Create lunch communitiesSet up a new community for your company or find a local community in your area. If you want to have several lunch roulettes per week, you can join more than one community. Intelligent matchingsOur algorithm is designed to match you with people that you haven’t been together with for lunch at all, or not in a long time. Not just random matching. Individual configurationDecide who is allowed your community and how often do you want to meet for lunch. Every week or just once a month. It’s up to you! Get access to our premium features and manage communities with an unlimited number of members. Three months free trial. Only € 19 (excl. VAT) per month per community after that. It might be that a community for your company already exists. Take a look here.